Unlike English where the vocabulary is a list of word with it own meaning, Chinese words are morphed out of characters which each has its own meaning. I.e. Chinese words are made of one or more characters. Furthermore, it is important to know that the top 1000 most frequently used characters would make up over 90% of text used by native speakers. Thus, it is important to learn and understand this association early to make studying Chinese effective. When learning your vocabulary, it can be very useful to learn the meaning of individual characters and see how they are morphed into words. In the Character Pond, you can click on any characters of the word to see its meaning and observe how the meaning changes when combining it with other characters to form new words. 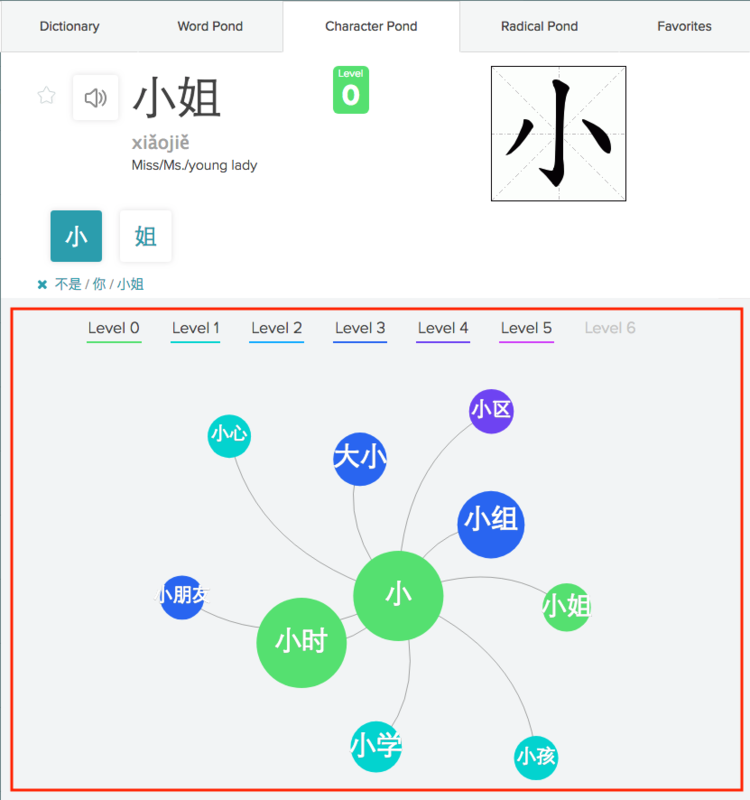 Interacting with the characters using Character Pond can expand your understanding of the language and be helpful for picking up new vocabulary. Character Pond is located under the third tab on your word pond panel. You can access the word pond panel by simply clicking any of the vocabulary words that you are currently studying. The Character Pond is divided into two main sections. In this first section it consists a lot of general information that you can find in the other tabs including: pinyin, definition, level of difficulty, etc. However, you will also find an animated graphic image that shows the order of strokes if you were to write the word on a piece of paper. If you are studying a word that contains two or more characters, you can choose any character by clicking on the character button. This action will trigger the Character Pond to make that character the focus of your study. The character in focus is the button with blue background. The bottom section is the Pond Visualization section, which is distinguished by the grey background. This tool is very similar to the one that can be found under the Word Pond tab. It is a visual took that implements the core, the character you are currently studying, and surround it by satellite words to help you familiarize words that are morphed out of the core character. 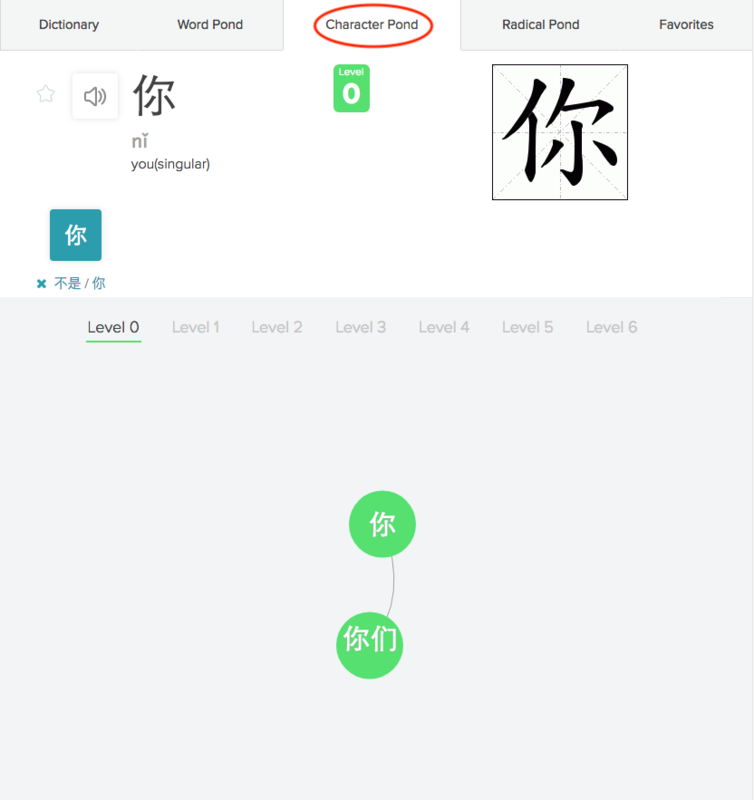 Clicking the a satellite word will show its pinyin and definition while double clicking it will replace the vocabulary through out the Word Pond Panel making it the new word to study and analyze. As you do this, a history bar will appear above the grey area that shows all the previously vocabulary which you can click back to and review. 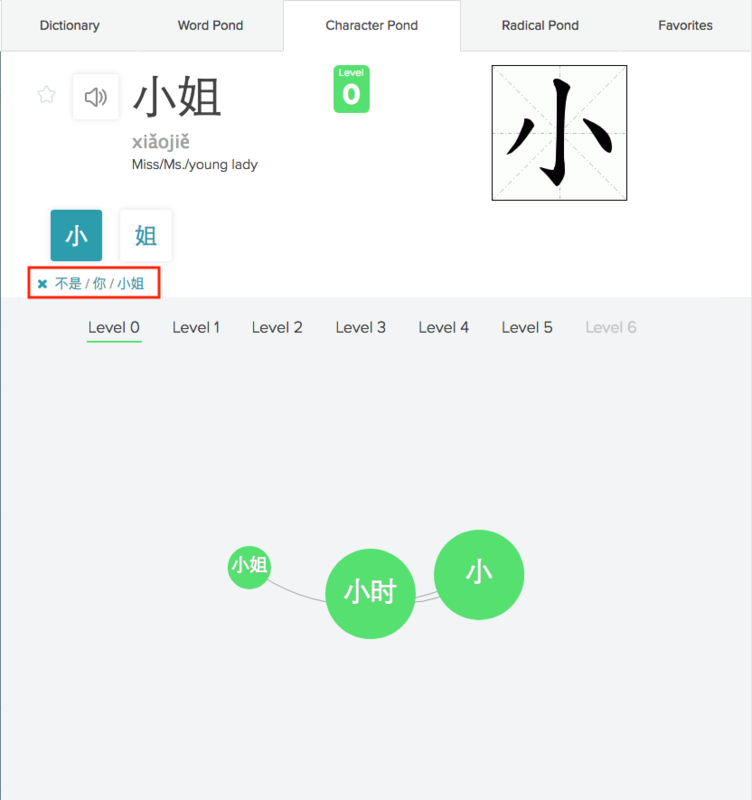 The level system is implemented in this tool so that you identify words at various levels of difficulty. By toggling the level switch, the words with that level will either show up or hide out allowing user to control the appearance of the satellite words. The words that are of lower level can help you recycle some of the word that you have already studied that may need review. Because Chinese words are morphed from characters, it is important to understand the meaning of individual characters and observe the meaning of the words that morph out of them. You may compare the literal meaning of the combines characters with the actual meaning of the word to enhance your understanding of the language. The Character Pond will not only help you learn the characters but also help you to recognize it’s use in Chinese language making your learning experience more effective. Previous PostCongratulations to all winners!